Sunset Lodge - Ram Mechanical Ltd. Sunset Lodge - Ram Mechanical Ltd.
Sunset Lodge is a 32 unit apartment building located in the Metrotown area of Burnaby. The building’s existing system for heat and domestic hot water production consisted of three cast iron atmospheric boilers with one storage tank. This older model system is common in many buildings, but is not very efficient. The building’s owner came to us looking for a long term, quality system to replace the existing system. 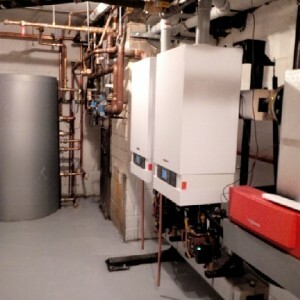 Ram Mechanical Ltd. installed a new system consisting of two Viessmann Vitodens boilers along with a dual coil Vitocell storage tank. Combined with other upgrades, the new system is operating at peak efficiency. The building’s owner reported that fuel savings in the very first months following the installation of the new system were 25% to 30% over the same period in previous years.